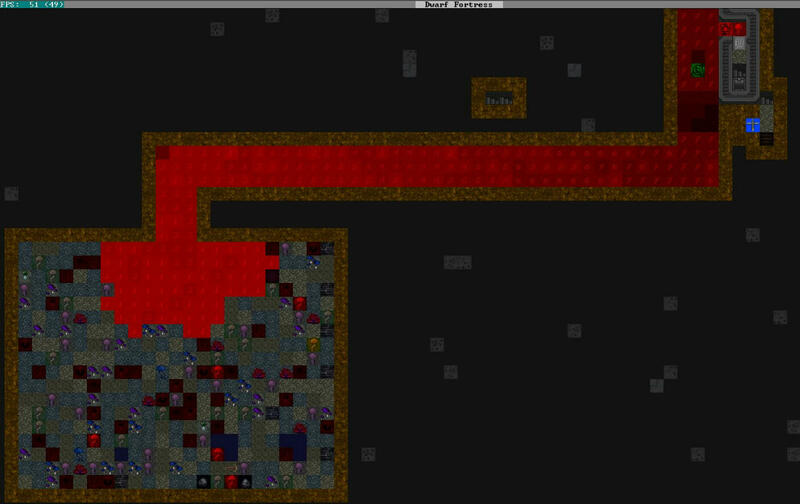 My first embark into a terrifying biome was filled with reanimating corpses and giant undead cougars. Quickly relocating to the caverns, the 16+ monster slayers I accepted for security turned every cavern creature into an undead monster. They then died to these undead monsters 1 by 1, adding to the growing number of threats. Having no buckets nor wood, all the woodcutters slowly dying of thirst in the hospital with most of the other injured, it wasn't long before the hospital turned into ground zero for the T-Virus as all the patients turned and killed the rest. A wave of 25 migrants arrived with no axes or picks, and no dwarves were left standing to pull the lever to open the drawbridge. But it didn't matter because a pack of undead monkeys and Giant Cougars made quick work of them all before they could assemble themselves. The last dwarf standing died fighting an undead chicken. Being knocked unconscious by a ferocious right toe'd kick, several combat log pages of being scratched in the head weakened her until the giant undead Cougar came in to finish her off. Edit: In her defense, he was a muscular chicken. The first reclaim attempt ended not even 1 month in as the 25 migrant undead brutalized the starting 7 together with the local fauna. The second reclaim attempt with 10,000 embark points: All 7 have bronze armor, iron war hammers, are skilled in war hammering, proficient dodgers, and disciplined. They put down the rabble and made a quick bunker box to get out of the green "rain" and giant undead carnivores. The aquifer under most of the map requires a long tunnel to the lower biome section of the site before stone can be mined and the army of angry ghosts memorialized. It turns out bringing stone would have been a good idea. Bravo! Are you using DFHack to remove Stress? Challenges like this are effectively impossible with the current Stress system. 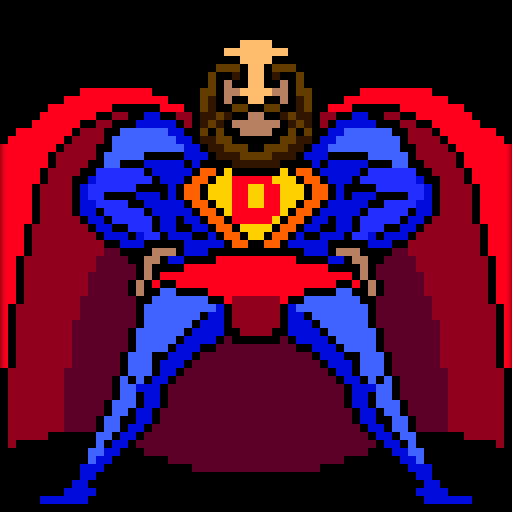 I haven't used DFHack at all yet. It's been on my mind to look into it at some point though. Challenges like this are effectively impossible with the current Stress system. not exactly. 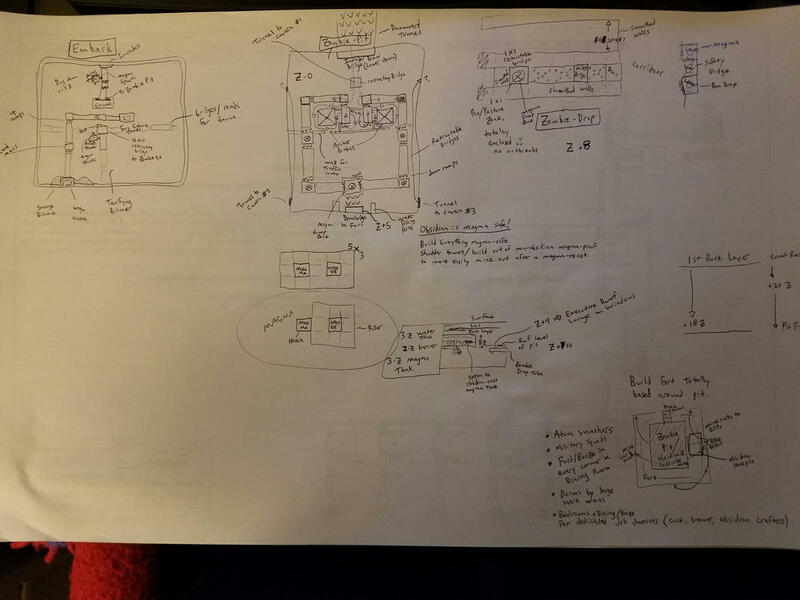 Maintainig stress in reanimating biome quite hard, but possible. Main trick is to completely destroy all corpses and body parts as fast as it can be done - mainly not because they are obviously dangerous, but because of strong negative thoughts even seeing them. So no refuse stockpiles and no burials, standing order to dump everything, magma or automatic smasher on dump zones instead of quantum stockpiles. Starting seven (except maybe miners, who will be all-time busy far from main carnage) and some waves is doomed to die either from wilddeath, weather or stress-related insanities, but established fortresses (mine, at least) arent have serious stress issues then. I haven't used DFHack at all yet. it is same "must have" tool as therapist, i think. Besides of many manipulations which can be considered as cheats, it contributes to interface. At least search in many in-game lists is a big deal. I've been fooling around a bit with evil biomes, and the stress issues aren't so horrid as I expected-- thus far, at least. 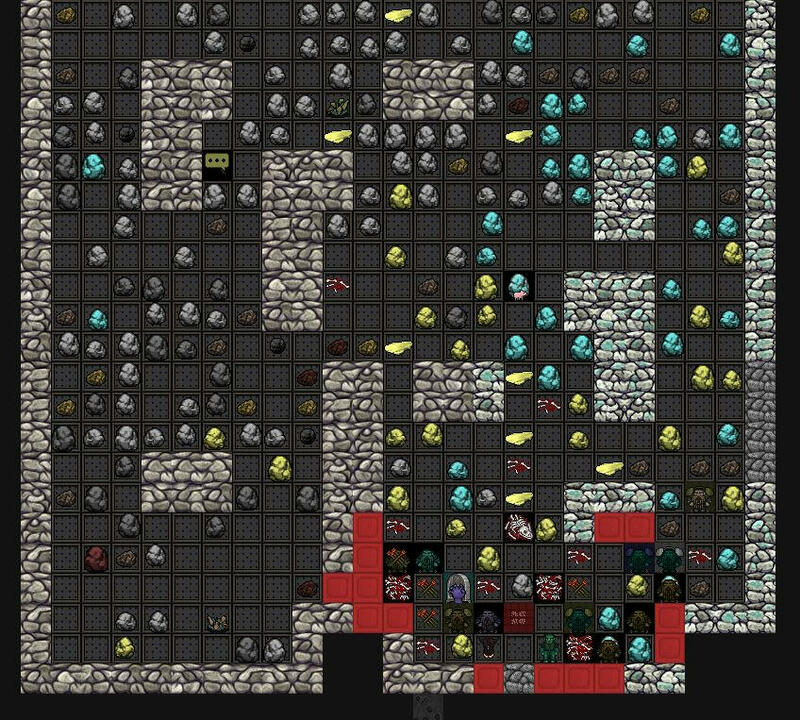 As it turns out, being constantly attacked by the undead really does wonders on a dwarf's psychological resistance; after putting down a few reanimating body parts apiece, most of my dwarves pick up "don't care about anything anymore" and come to handle the horrors just fine. I had to abandon the initial starting zone and find another. Having several migrant waves, trade caravans, embarks, monster honters, and wild critters all die on the surface makes for almost an insta-death embark. The new site is equally dangerous, hopefully more so. It took a few probing embarks, but I found another reanimating evil biome with high savagery. It's a hot climate, so not much evil rain, but there's potential for giant elephants and rhinos which is always good. It seemed like a worthy trade off. So far just undead boar packs and cougars have been roaming the surface. 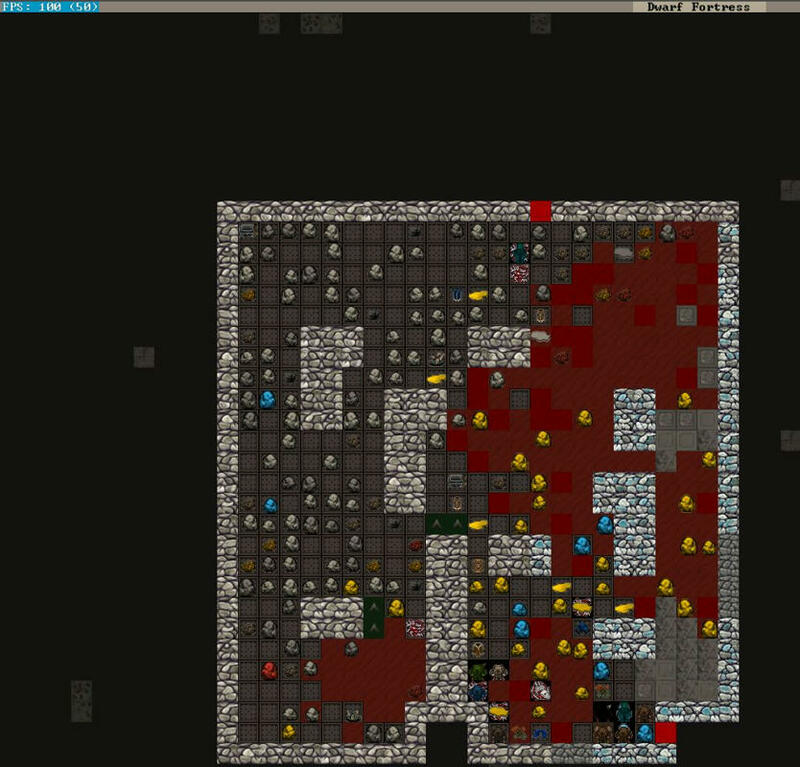 Having learned my lesson on the last 4 failed embarks, I first set up the butcher / drawbridge smashing dump zone. There's also a lockable pen where grazing pets are spared the zombie mauling of trying to graze on the surface and can instead starve to death in relative peace. Where upon they then maul the other pets in the pen having just turned into zombies themselves. 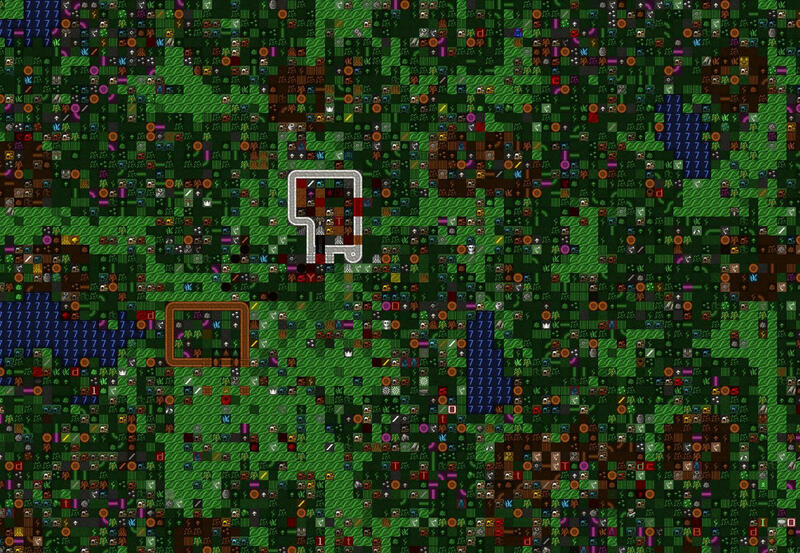 Phase 2 of that plan involves digging out more rooms to isolate grazing pets from each other, but as it is now, it protects the fort in its current configuration. Two migrant waves managed to have excellent timing and pass the undead boar herds completely unnoticed. The trade caravan unfortunately was not as lucky, but managed to put all the boars down. ....For now. I'm not going to venture into the caverns so early and unprepared this time either. And any monster hunters petitioning to join my fort can go straight to hell. Here's the dumping pit, next to the butcher's shop (surrounded by other associated workshops), and the dining hall as it is at the start of year 2. 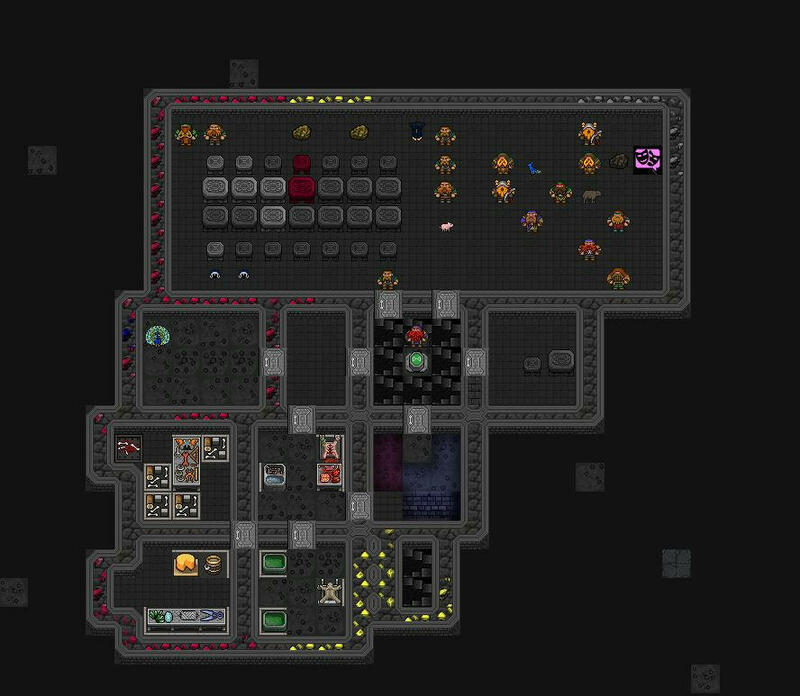 Side note: I just started using the "Meph+Vordak (lite) 32x" tile set included in my Lazy Newb Pack, and it's really nice. The detail put into it is great. For instance (not shown) marble furniture such as tables, chairs, tombs, coffers, etc. look different than those of common stone. The smoothed walls are also quite nice to look at (hence why I smoothed everything). My room mate even told me "It looks like an actual game now." At this point, it feels easy having learned from the past several losses, so I'll have to take some steps to increase the challenge. Starting some wars might do it. Establishing a surface presence is another idea I'm leaning toward. It turns out I have been using it. The list searching, and sorting trade goods by value or distance are incredibly helpful features. I just haven't used the command input interface of it. 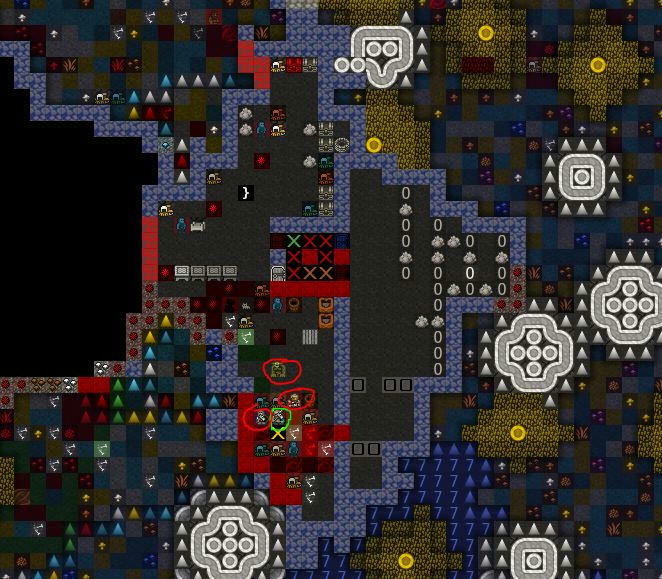 Notifications of starving dwarves is nice too for when the miners have mined themselves into a place they can't get out of. Wouldn't it be awesome to keep all dead zombified animals near surface behind a drawbridge, provoke war with elves (or anyone else), and then release "your" zombies at any invading force that arrives? I could pasture them on 1x1 platforms next to a retracting bridge over a 3 z drop, wait for them (or not) to turn zombie, walk onto the bridge and drop them into the holding area. The holding area could be isolated except for 1 point: Drawbridge access gate to the surface. Then there could be a series of retractable bridges spanning gaps between pillars of gradually increasing height up to a drawbridge gate into the fortress to lead invaders onto the bridges above the zombie horde. They could then be dropped from varying heights depending on how much advantage my zombies need. If it goes successfully, the zombie horde population will quickly become a problem, so magma will be involved at some point somehow. Careful planning would have been a good idea. But I went for it all at once: Dig the zombie pit, construct a maze of bridges, build retracting bridges to pasture starving animals, and construct a drawbridge to seal the pit from the fort. 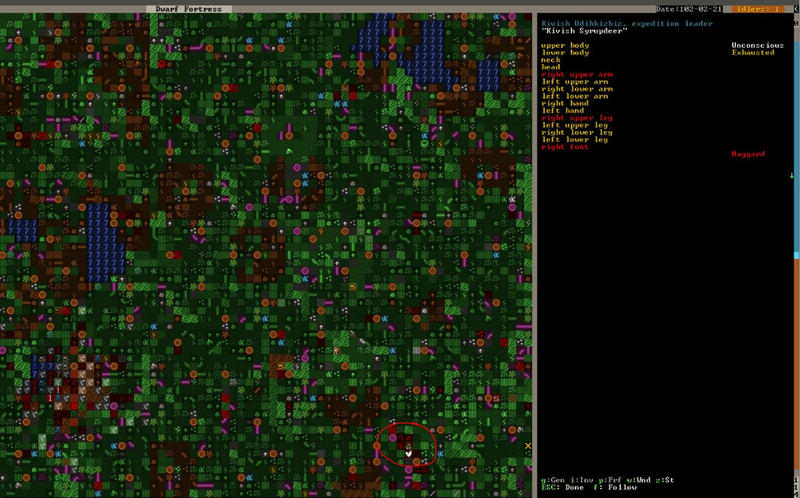 I had 80+ adult dwarves so there was no shortage of labor. The first thing completed was pasturing the starving animals on the bridges. 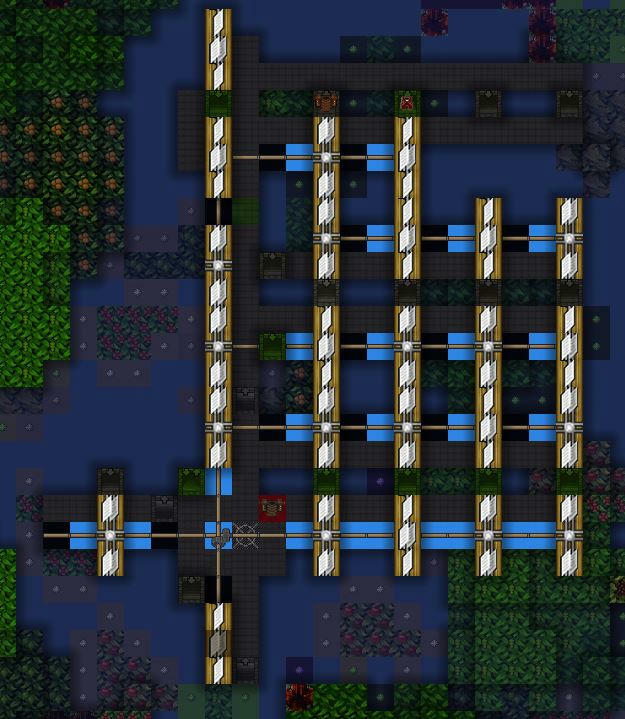 Since not all of them were linked to levers, a single 2x2 bridge had 5 animals on it. The original plan was to seal the animals in rooms, then open a bridge and wait for them to path onto another bridge where they would be dropped. But when I found that I could create pastures on top of retractable bridges, that just seemed better. As it turns out, having just a 1 tile gap between the bridges, and a shared back wall, the zombie animals are able to cross from 1 bridge to another. Also, dwarves walking nearby to get to the dig site find it irresistible to attack them. And dwarves too are able to somehow scurry along the walls to get to the zombies on the bridges. When fighting on the bridge, some of them fell or dodged off and fell 5 z levels. So did some of the zombie animals. No big deal I thought, I'll just dump their corpses into the atom smasher... That was until several other dwarves died to the zombie cattle and new zombie dwarves. A squad of 10 well trained mace Dwarves was stationed to protect the cleanup efforts. 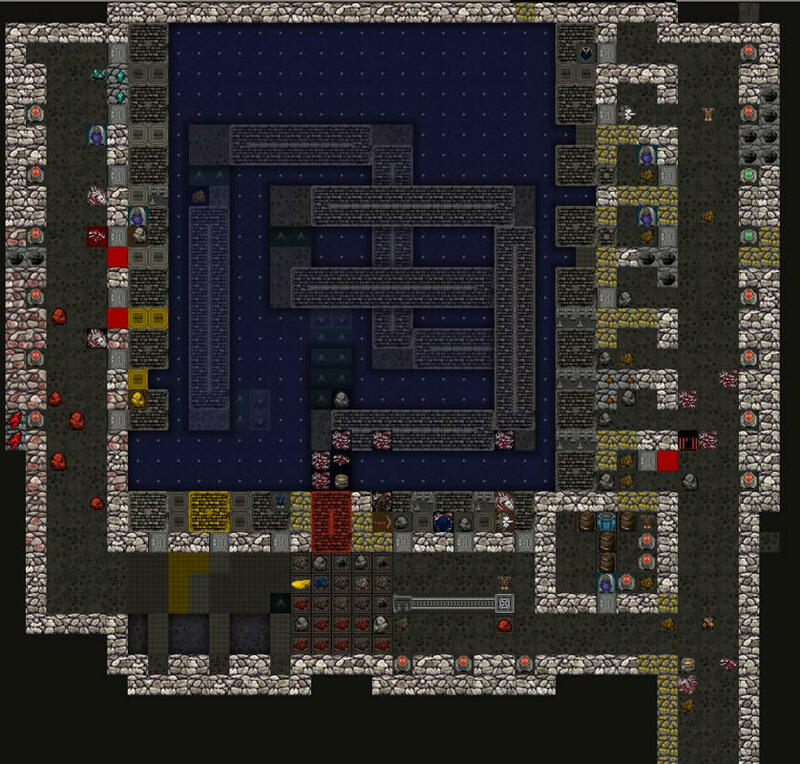 But hat quickly spiraled out of control and 26 dwarves were killed and turning into zombies on the spot. This was now ground zero of the zombie apocalypse. Hastily, a lever was constructed in an attempt to link it to the 1 bridge that could seal off the pit from the rest of the fort. But before any links could be made, the zombie horde was chasing the living over that same bridge. In hind sight, that would have been a good thing to set up first. But it was time for plan B: construct a wall at the next choke point where the initial tunnel was dug. These zombies however are not like the ones you see in the movies. When charging after critters, they are FAST! And that's exactly what they were doing, chasing after the few remaining living pets right down that tunnel. ...It was not sealed in time. Fortunately, the barracks was right around the corner, and Team Alpha was able to put them down as they approached. 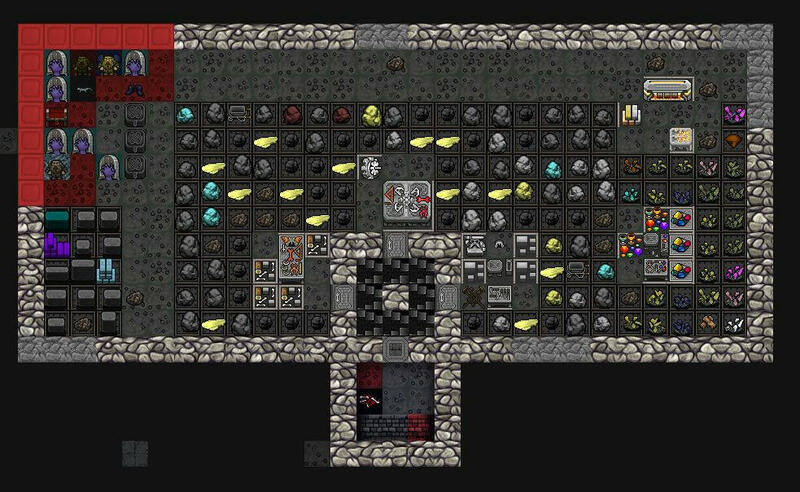 At this point, 40+ dwarves had died, so the entire tunnel and pit was mass forbidden to prevent any more temptation to recover wounded or store items in a stockpile. Most of the surviving dwarves were now in the sub-par hospital (no soap, no water), with 10 sharing a single bed. Desperate times I guess... Checking in on the status of Team Alpha revealed that they were down to 6 from 10, so they retreated back to the subterranean farm plots / stairway entrance to the main fort. The breach was lost. The farms will be the last stand. The surface was sealed off to prevent the large pack of giant undead hyenas from coming in, and also to prevent dwarves from venturing top side to say hi to the surface zombies. A good long last stand it was. Only 1 zombie at a time managed to straggle down the other tunnels and into the farms, where they were pulped by the 6 mace wielding heroes. But then someone had to go and die of thirst in the hospital and turn into a zombie. In mere moments, the hospital corner became the second outbreak of this zombie apocalypse. No big deal - doors had already been built everywhere, so they were locked and forbidden. 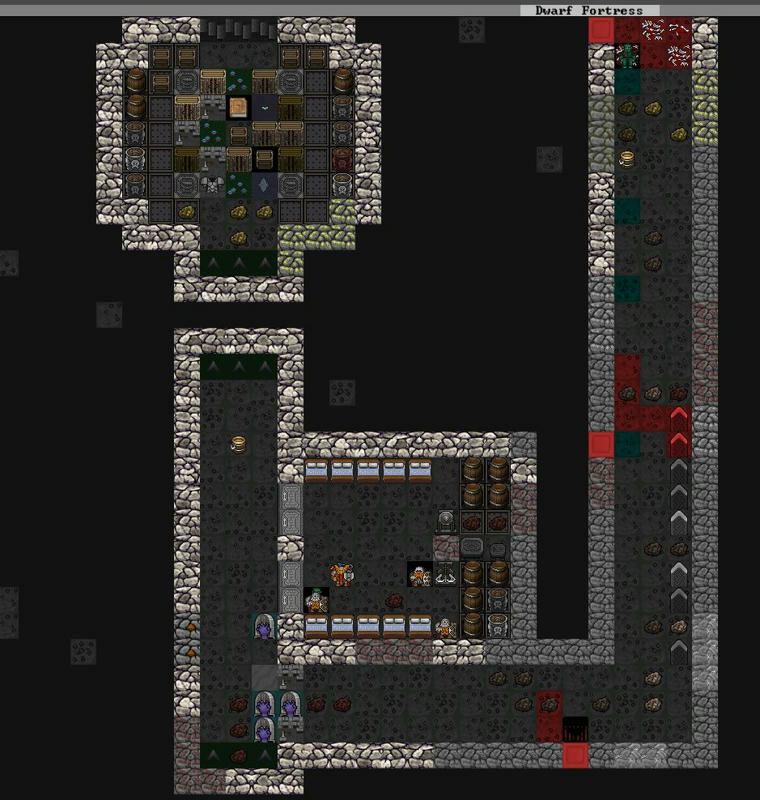 Urist McStupid however was able to open forbidden doors to haul some stone to the stockpile next to the hospital, and release them into the main stairway. 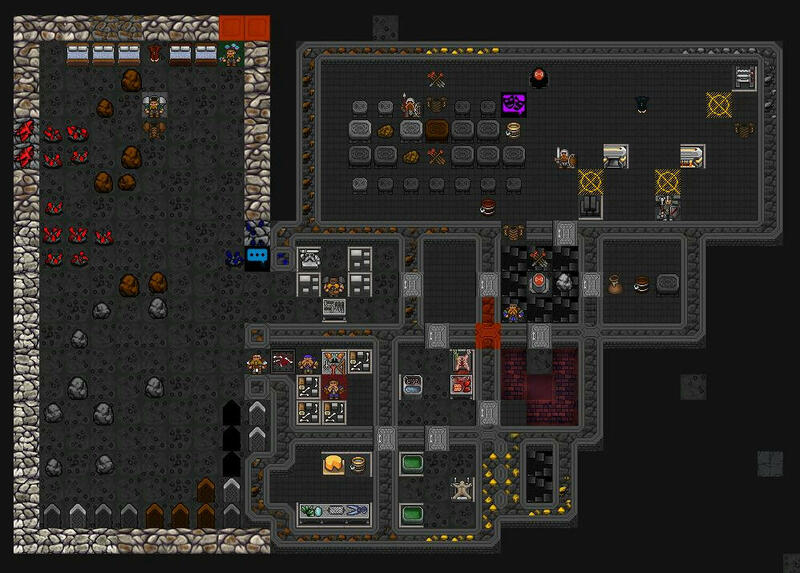 Team Alpha valiantly fought them back, more dwarves were hastily recruited into the squad, and walls were built around the doors to stop the rest of the horde from being let in. Now it was a fight to atom smash all the corpses, and also fight their severed body parts crawling everywhere. 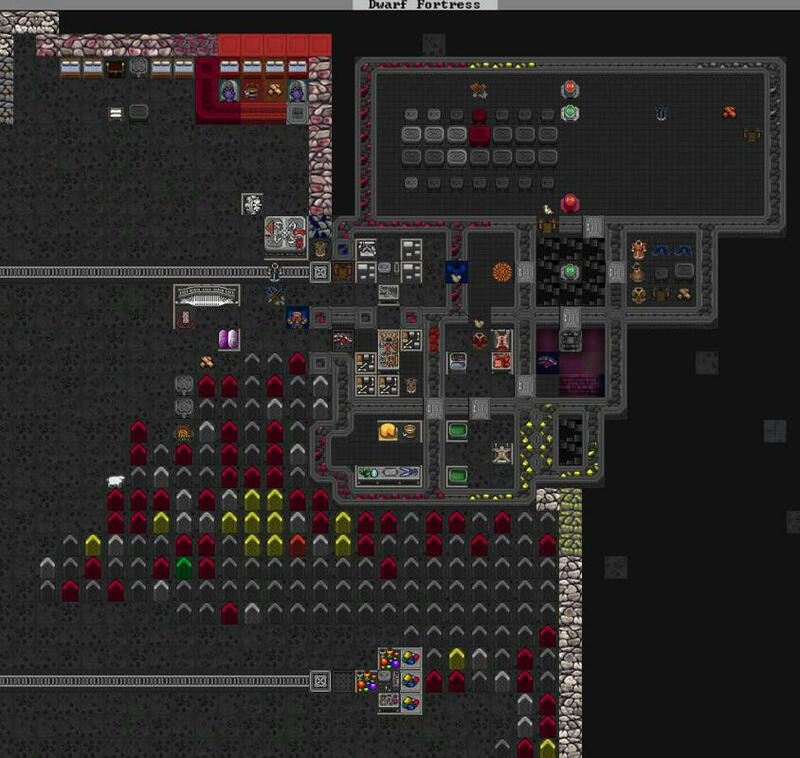 At the darkest hour, 5 adult dwarves (1 insane, 3 totally stressed and harrowed) and 7 children were alive before a migrant wave arrived. Everyone was drafted into inactive squads and given just 1 labor: Refuse hauling. A few more died, but the corpses were cleared, and another wave of migrants arrived. With the apocalypse under control, the task of engraving 181 memorial slabs begins. The plan remains to use zombies for defense. However magma may have to be pumped into the pit for now to deal with the zombie horde before progress can continue. Edit: I honestly did not expect to have to resort to magma so soon. The few survivors luckily had a massive food and booze stash that was uninfested by zombies, so they were able to go into full memorial slab carving mode. Ghosts really get in the way of productivity. Also, a few iterations of attempted hospitals had to be sealed off to help contain the zombie explosion. With the ghosts under control, and all the remaining corpses and crawling limbs atom smashed, it was time to get that magma involved. It was a few firsts for me: first pump stack, first windmill farm, first dwarven micro water reactor. It took over 700 Urists of power to bring magma up above the zombie pit. With only 20 power per windmill, I gave in to the allure of the Micro-Reactor which instead nets 90 power each. I was going to need way too many windmills otherwise. The giant square space was going to be a magma holding tank with levers for particular hatches to target magma drops on certain points of the zombie pit trap with laser-like precision. Due to the zombie apocalypse however, no hatches were ever constructed, and only a few drop holes were dug. Saving and re-opening the game seems to clear much of the magma smoke from view. Edit: with all that has happened so far, and the dead count up to 256, this thread should be re-named Riling up the Terror. But it's just the storm before the calm. There are grand plans for this embark. Just waiting for a 7-Z level deep pit to fill completely with magma. The magma sea level has dropped to 3 in some areas from the so far 18 month pumping operation, resulting in the magma forges now being unpowered.